Sunday, April 5th has been a long and tiring day, but very rewarding. 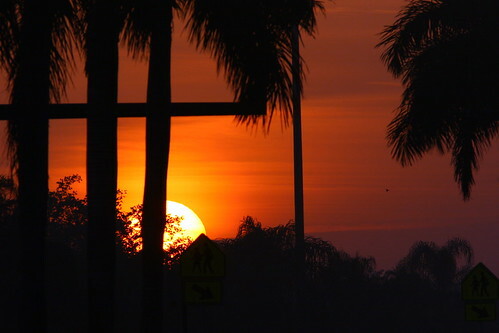 As you may know, Hope, the older of the two neighborhood Bald Eagle chicks in Pembroke Pines, Florida, suddenly left the nest at 7:30 AM the previous morning. Hope was exactly 11 weeks old, the average age that eagle chicks fledge. It was a great milestone in Hope’s long journey into life as an adult. Hope’s first flight was very brief, consisting of a couple of circles in front of the nest, then a dash to a nearby tree to the southwest. She was said to have crashed rather audibly into the upper branches, as if unable to purchase a grip, then dropped rapidly straight down, not to be seen again. 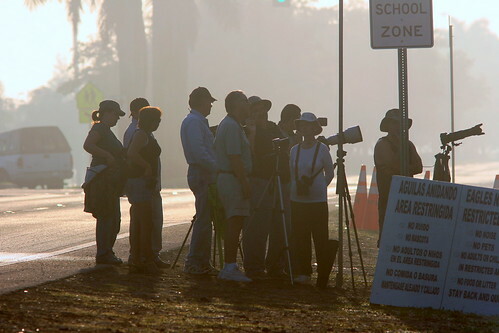 Mary Lou and I did not see the event, having gotten to the site at about 8:00 AM, so we reconstructed it from the descriptions of eye witnesses who had arrived before sunrise to stand watch at the nest. As we had been advised, we called the Florida Fish and Wildlife Conservation Commission (FWC) Wildlife Emergency Line to let them know there was an eaglet on the ground and that we had concerns that it might have been injured. They responded promptly and two FWC agents searched under the nest and the general area of where the chick was last seen. They turned up no sign of Hope, and said they believed she had probably flown out of the wooded area. There followed hours of anxious waiting, for signs that Hope had not been injured. The adults never seemed to be alarmed. 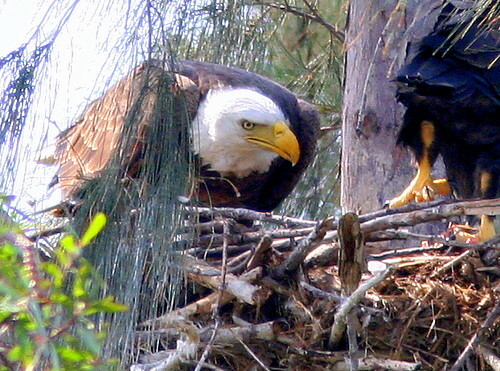 At 11:00 AM both arrived at the nest simultaneously with fishes in their talons. As they approached, Justice started his usual begging: flapping and squeaking. About 50 yards to the west, Trisha, one of the regular watchers, heard the cry of a second chick, outside the area that had been searched by the FWC agents. For the rest of the day, no one heard the second chick again. The adults brought in fish a couple of more times, just dropping it into the nest. Justice, five days the junior of his sister, seemed not to know what to do with such largess, and appeared to ignore the third feeding. Justice was also strangely quiet, and did not exercise his wings all the rest of the day. As evening approached, we sought the expert opinion of eagle researcher Brian Mealey. He reassured us that it is not unusual for a chick to leave the nest and not reappear for a day or two. 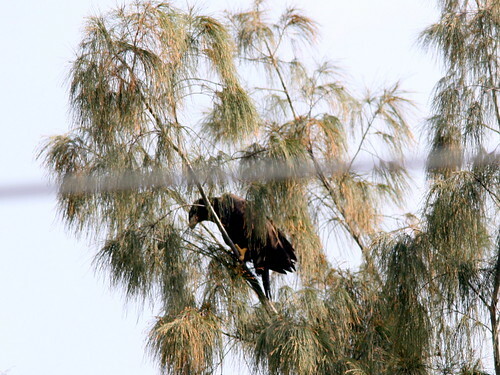 He advised that we watch the parents and let their behavior provide an indication of the location of the “lost” eaglet. Parents may approach, or even feed her. Sensing our anxiety, he graciously offered to drive up from South Miami if we have continuing concerns about Hope’s welfare. This morning (April 5th), a cadre of die-hard observers were at the nest before dawn. We watched a red sunrise as the light fog lifted. By 9:00 AM no adults had visited, and Hope remained out of sight and sound. However, both adults soon arrived, and by around noon, Justice had been fed two fishes and a large white bird that looked like a Cattle Egret. Perhaps not surprisingly, Justice neither begged nor called for food, and seemed to ignore most of what was offered. Brian Mealey and his wife Greta, who is a wildlife rehabilitator, called to say they were coming to look for the chick. He had obtained clearance from FWC and Pembroke Pines Public Works Director Shawn Denton. To my great surprise and delight, Brian and Greta invited me to help them look for the chick. Not too far into the search, I was very happy that I had brought a full bottle of water, as temperatures had climbed into the low 90s. 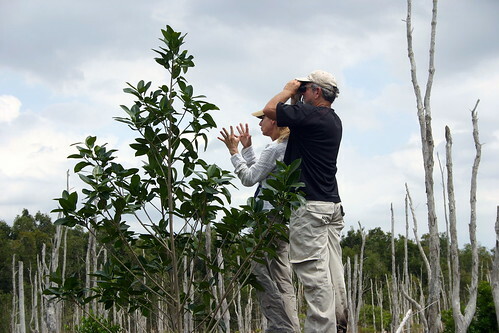 We began our exploration in the stand of dead Melaleucas to the west of the nest tree, and progressed eastward into the general area of where the Trisha had heard the chick’s calls. We walked in a line, about 40 feet apart. We had to keep in constant voice contact after we entered the “Eagle Forest,” as the tangle of live Melaleucas, deadfalls and shrubs greatly limited our sight distance. 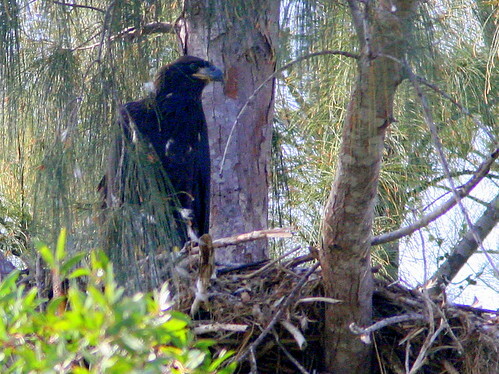 We probed every likely bush and sawgrass clump that might harbor a grounded eaglet. 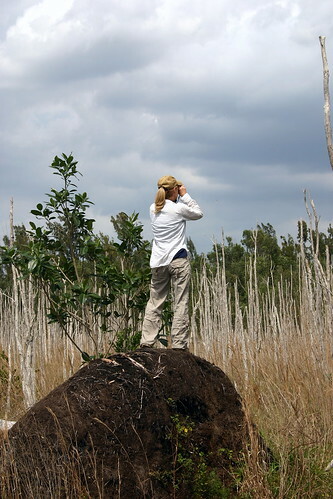 We listented for possible scurrying sounds, and checked the tops of every tree. When we reached the area just west of the nest tree we cut to the right (south), then doubled back to cover another swath from east to west. Without benefit of GPS locators, it was almost impossible to walk a straight line, as there were dense thickets and many large uprooted trees blocking our way. We heard only the myriad sounds of the dense woodland: Red-bellied Woodpeckers, Blue Jays, grackles, starlings, and omnipresent mockingbirds. By then, my water had given out, but I felt energized and hopeful that our search would be productive. We resumed our methodical prodding, encountering a rather large circular pond that looked like an extict alligator hole. 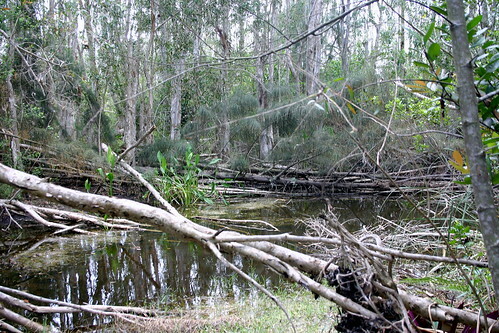 The ground underfoot was soft and slightly wet, about the way the Everglades should be at this most arid time of year, and only Brian got wet, stepping through a tangle of dead brush into calf-deep water. At about the 2 1/2 hour point we had coursed quite deeply into the 3000 foot southern extent of the 27 acre woodland, covering most of the western third. It would obviously be impossible for us to inspect much more in one day, althoug Greta appeared willing to press on (until nightfall, I feared). True to her rehabilitator instincts, she had brought an entire eagle retrieval kit in her backpack. Based upon his extensive experience as a Bald Eagle researcher, Brian made the executive decision to change tactics. We would walk westward out of the woodland, in sight of the adult eagles, and see whether they showed any anxiety that might tip us off to the location of the chick. Nothing happened, but we did see a very dark hatch year Bald Eagle flying over us and away to the west. Could that be Hope? Brian said no, it was much too accomplished a flyer, and probably represented a wanderer from a nest to the south of us. My adrenaline rush was short-lived. 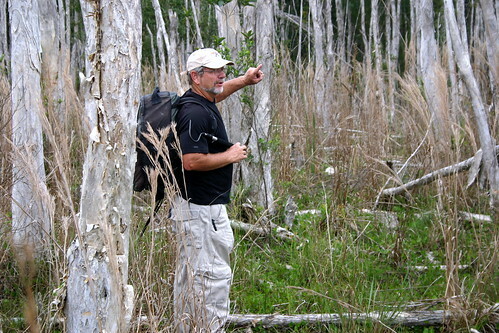 By now, Brian had ranged about 200 yards west of the woodland, into the South Florida Water Mangement District (WMD) land that contained thousands of herbicide-killed Melaleucas. Greta remained at the edge of the woods. I was in between them. Suddenly Brian yelled to me to go over to Greta. 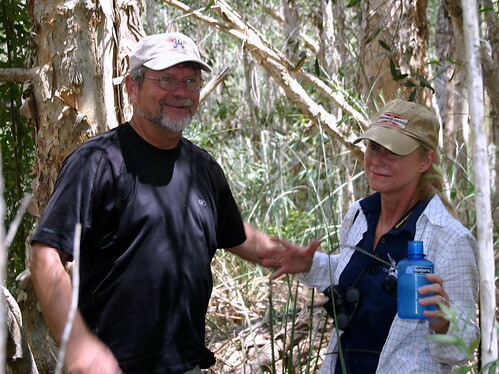 He must have called her on her cell phone, for she told me that Brian had just seen a juvenile eaglet flying from the top of one Melaleuca tree to another, only 50 yards into the woods from her position. We carefully made our way into the shade of the trees, and looked up into the canopy, but found no eaglet after about a quarter hour of searching. 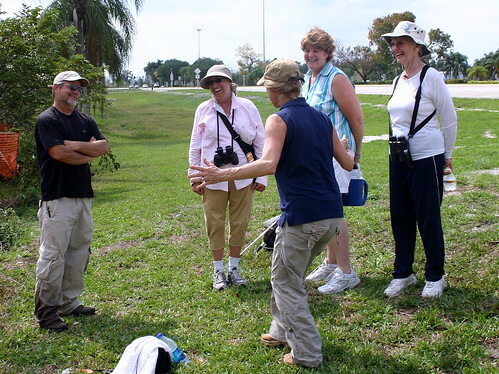 We then gathered together, and Brian told us that this behavior is commonly seen in newly-fledged eaglets. They make short flights from one tree to another, before undertaking longer flights at greater altitudes. He was quite convinced that he had seen Hope! It was, perhaps, one of the highest points within the WMD Melaleuca graveyard, and offered a view of the treetops well into the “Eagle Forest.” We could see the nest tree, and even the uneaten body of the egret atop the nest. An adult roosted at the very tip of the tree. 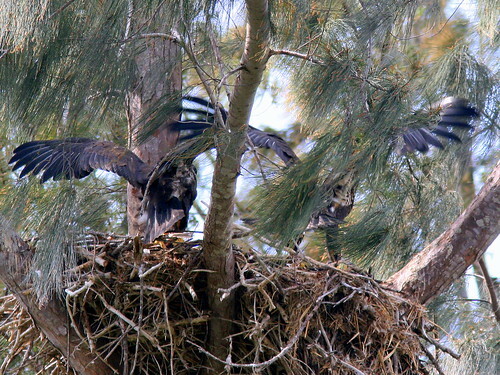 This was a bit unusual, as they have better roosting limbs just above the nest. However, we never caught sight of the treetop-hopping eaglet. We headed back with the good news, and were greeted by the other watchers, who filled our water bottles as quickly as we emptied them. Greta gave a serious demonstration of how she once saw an eaglet meet a tragic end. 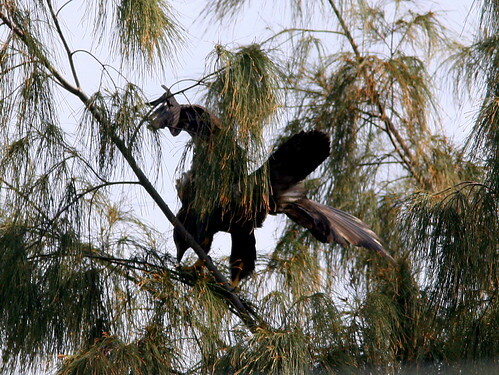 Rushing back and forth on its nest, its neck hit a transverse branch, and its neck was instantly broken. Not hearing her sad narrative, I thought her imitation of the hapless flapping eagle was some kind of an eagle-lover’s ritual dance! Now comes the best part of the story. After spending about 3 1/2 hours slogging through the forest, I was totally wiped out. We said good-byes and started driving home. We had not driven more than two miles when we received a call from Trisha. She reported the almost unbelievable news that Hope had just flown to the top of the nest tree! Of course, we turned around and hurried back to see the grand sight. 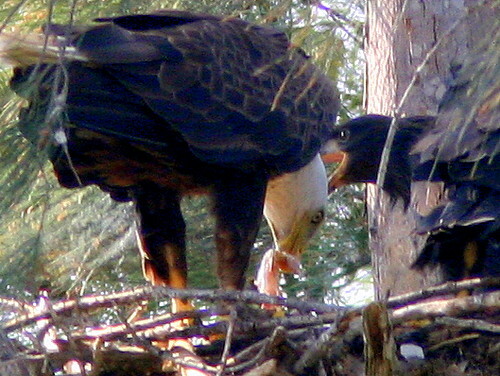 Within minutes, an adult arrived at the nest with a fish. Justice squealed as if he had not had a meal in weeks, but seemed not to eat at all. Meanwhile, the big sister who had been his nemesis at feeding time flapped her wings and begged vigorously. She did not come down to the nest, and the adult seemed to just ignore her. Brian said this may be normal behavior on the part of the parent, to lure the chick back to the nest. We left, feeling quite gratified. In a way, our entire half day of searching had been wasted time, as Hope proved she was in good shape and could get back by herself. Yet, I would not trade this experience for the world. 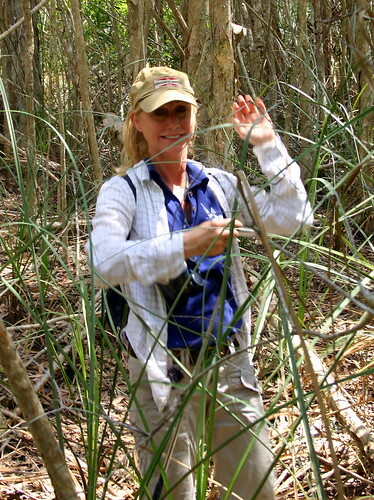 It was such a pleasure to see the hidden wonders of the “Eagle Forest” and the Melaleuca graveyard, and to work with and learn from two wonderful, energetic and dedicated scientists.